Have you ever thought of not dispensing certain products, or items, and made them into something useful to organise your kitchen? That’s because it’s possible! A simple product like a common biscuit container can be reused as a utensil holder and that’s not all, here are simple items that can help you ease your way into the kitchen counter. By just pasting the label for your spices on to the tic tac boxes, makes your cooking life so much easier. Easy to hold and easy to find the right ones. The hassle of finding where’s the lid for a container has always been a major struggle for most of us. Luckily, those old CD racks that we used to store our music albums, has served a greater purposed. Now we have more reason to recycle those tin cans that we like to throw a lot. By just removing the cover and adding a bit of art, we can place our utensils in an orderly manner. Such simplicity. Whether it will be strawberry jam, marmalade jam or blueberry jam, keep their jars because it will be an amazing addition for your kitchen counter. Why? 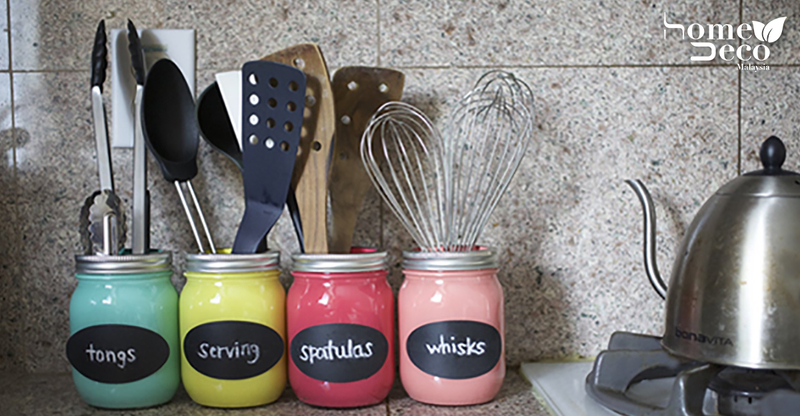 Well not only it will look fantastic but imagine how neatly we can place our cooking utensils in each coordinated jar. Every part of the kitchen utensils has a home including those fancy knives. Why buy a knife holder when you can made one at home. Those bamboo skewers that we used for barbecue, well now they have a reason to be recycle. Place a bundle of the skewers inside an empty jar and slide in those shiny knives.